Make the most of your time outdoors with some extra seating. Here’s our guide to what’s available. Sitting comfortably? If not, why not? Whilst it’s easy enough to enjoy home comforts inside your motorhome or caravan, there are times when you want to take advantage of being outdoors – or under an awning – just sitting back and relaxing. That’s where decent outdoor seating comes in. Luckily, there’s a great choice out there – from smaller units that are easy to stow, all the way up to full loungers, with all manner of adjustability. Don’t forget, too, if you want to make the most of your investment, any outdoor seating you can also use when you’re back home in the garden will be an advantage. Height matters. 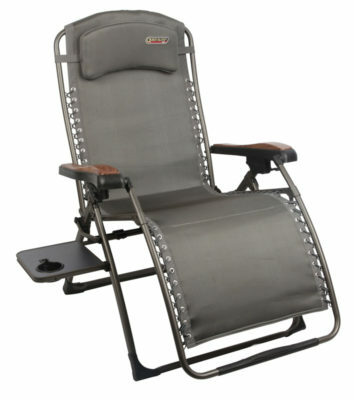 Check the seat height is compatible with any outdoor table you wish to use. Also, remember lower heights can make getting in and out that bit trickier. Ironically, most outdoor seating isn’t capable of coping with the weather. If you do have to put such units away wet, make sure you dry them at the earliest possible opportunity. Likewise, if food or drink gets spilt on them, wipe it off instantly. Look for mesh panels. They’re great for ventilation, especially around the back area. But, you might want to cover up when temperatures are cooler, or if there’s an unwanted breeze. Any local caravan dealership, assuming it has a decent accessories shop, is a great place to start looking at – and trying out – any outdoor seating. Also, major camping retailers usually stock a good range of such products. Try ‘em out for size, ease of use and, most importantly, comfort. Make sure you can store such items when travelling – whether in your motorhome’s underseat space or (better still) exterior access lockers. Or, if you’re towing – either in your car or your caravan. 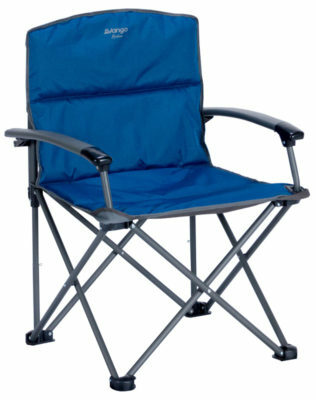 Make sure you include the cost of an outdoor seating in the sums insured of your caravan or motorhome insurance. If on-board storage is a major issue, how about a design like this? Not only is it compact – folded dimensions are just 50cm x 14cm x 12cm – it’s also very light (2.1kg). That large mesh panel at the back doesn’t just help keep the weight down – it also helps with ventilation. The rest of the fabric is a superior quality 600D Oxford polyester. Plenty of manufacturers put their name to this popular style of outdoor seating. This is the Royal version and it represents good value for money. As ever, though, shopping around might yield even more successful results. It can take weights of up to 110kg, but it weighs only 4.75kg. 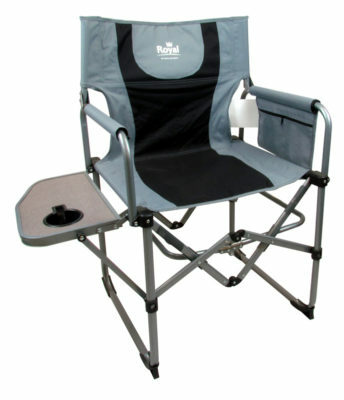 Key features are its side table, complete with cup/bottle holder, and a zipped pocket (on the opposite side). There’s also a choice of colour – Black/Silver and Red/Silver. Do check the weight limit on any chair you’re thinking of buying. It’s only a manufacturer’s recommended figure, but it will give some idea of the overall quality of construction. Here, the figure is an impressive 180kg, complementing the larger than average dimensions – 61cm x 67cm x 95cm, with a seat height some 47cm from the ground. There’s also extra padding in the main seat and back areas. This stylish little number takes its name from the elasticated loops connecting fabric to frame – an arrangement that offers plenty of support all the way up to 136kg. Padded, removable armrest pads add to the comfort, too. It couldn’t be easier to open out (to 66cm x 70cm x 91cm) and fold back down (32cm x 22cm x 110cm), either – and there’s certainly no mistaking the distinctive colouring. Choose between lime, blue or orange. “zero gravity” stepless relaxer design with elasticated support to the seating fabric and an adjustable headrest that can also double as a lumbar support. The aluminium main frame means overall weight is kept down and it’s that bit easier to set up. The fabric, meanwhile is UV-resistant, breathable and quick-drying. It can take up to 120kg and it’s certainly a “large” when opened up – at 70cm x 80cm x 118cm high, with a seat height of 51cm. 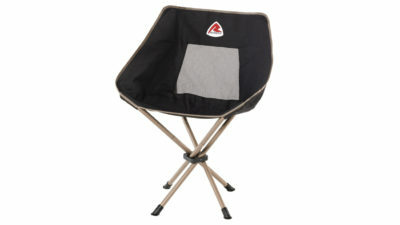 It folds down to 70cm x 15cm x 98cm. 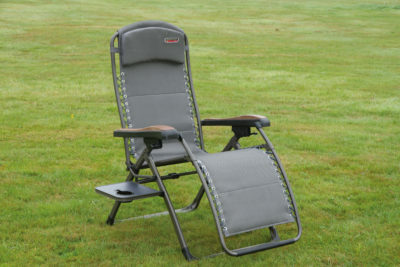 What kind of outdoor seating do you use when touring in your caravan or motorhome and how important is it to you? Feel free to share your comments below.